Norway has a long coastline on the north and west of the Scandinavian peninsulas, indented with the enormously dramatic and deep fjords and reaching beyond the Arctic Circle. Tourists are attracted to the scenic landscape in summer and to the ski resorts in the winter. The currency in Norway is the Norwegian Krone (NOK). (1 NOK = 0.09 British Pounds or 0.11 Euros approximatley). 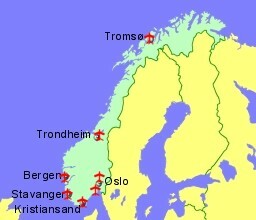 Norway is a Schengen country although not part of the European Union.